This post is part of the Dog Agility Bloggers Network topic “Success.” Click here to read other blogs in the series. I have experienced some very gratifying agility successes with my standard poodle Rush, who turned 3 years old on May 11th. We’ve won high-in-trial (large dogs) at the Poodle Club of America’s regional in Salem, OR last fall AND in the non-sporting group at a local trial (with nice ribbons, too); we’ve won the 24″ class in Time to Beat at an AKC trial (video here); we’ve qualified for CPE Nationals (coming up this weekend–stay tuned); he’s well on his way to getting his CPE C-ATCH. I started Rush’s start-line stay the day I brought him home from Vikki’s; nope, you don’t get your supper until you stay still while I put the bowl down. It took him just a few minutes to learn that, at nine weeks, and we were well on the way to his solid stay. I wanted independent weaves–and once I started training weaves (14 months old) I also started training finishing the weaves while I did something else. I worked on jumping skills when Susan Salo gave a seminar locally. Fast tunnels: I’ve seen so many big dogs slow when they go through tunnels, and I didn’t want Rush to slow down; I taught him to flatten and go fast as one of the first things I trained. Contacts? I’ve spent years training and retraining and retraining Dancer’s contacts. I really wish I knew then what I know now: pick your criteria for contact performance and stick to it. Then train that performance with as many methods as you can think of and proof it. With Rush, I chose a stopped two-on-two-off contact because I’d seen the most success with that criteria. It’s very clear when the dog has met criteria. I needed that clarity. Two-on-two-off and stopped also has the advantage of being less reliant on precision timing. My timing with rewards is terrible. If I click, I click too early or too late; if I say “yes!” I may say “yes!” at precisely the wrong moment, such as exactly the moment when the dog goes airborne from the apex of the a-frame. With 2o2o, I could wait until I was sure the dog was stopped with paws in the dirt before I said anything; being late was just fine and it was harder to be too early. For Rush, I started with a foot target; I back-chained the contacts on the equipment. Once I started to get correct performance, I started setting up as many different scenarios as I could think of. If he met criteria, treats/toy/playtime/continue on–if not, “too bad so sad” and a slow walk to his crate where he waited while I played with Dancer for a few minutes. I learned to wait a beat or two or three before rewarding in place or releasing, so that I could check my mental picture of perfect criteria against what I actually saw. Rush’s consistency with contacts is very high; I simply no longer worry about whether or not he’ll meet my criteria, even in trials. It’s great–I can get on with handling his path to the next obstacle while he does his job. It also has the bonus of giving me a place where I can catch up with him! But beyond training specific tasks, there were other decisions. I decided I was never going to try to slow Rush down. That immediately led to some other decisions: first, I needed to be faster; second, I needed to vastly improve my handling; third, I needed to train distance; fourth, I needed to lose weight. I refer to Rush as my personal trainer these days. He motivates me to improve; the thrill (the rush!) of a successful run with him is enormous. It requires precision timing to direct him–he takes a single stride between obstacles, and that means he needs to know before he takes off where he’s going when he lands. And if he doesn’t know? Well, Rush is a master of timing with his corrections: he gives a quick bark to let me know when I was in his way, my cue was late, he had to correct his path. When I hear that bark, I know I screwed up. A series of decisions. They all stem from one decision: the decision to change how I approached my own life and my agility ambitions. I look back at that sweet, tiny poodle puppy and I realize that, not only have I left the back road I was on, but I’m now driving a race car in the fast lane. How many tiny little changes did I make? I’m not sure, but it was one decision at a time–and the refusal to leave the new course each decision set. 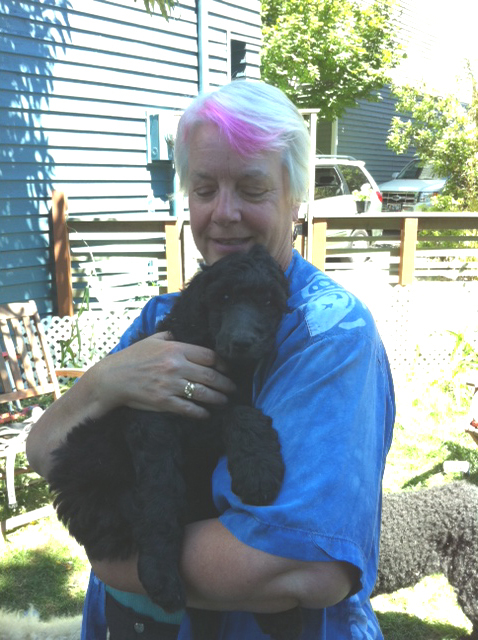 This entry was posted in life with poodles, training on June 4, 2014 by Diana. thank you for sharing your agility experience. I enjoyed reading it and loved the car steering analogy. Umm…that gives me food for thought! thanks! I love your article! Very thoughtful and great ideas on small changes making a big difference.